Joe Berry during a race last year. 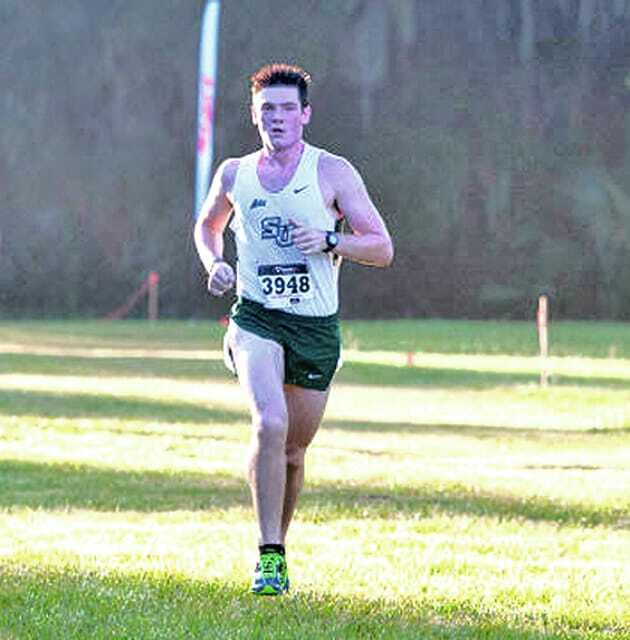 Stetson University rising junior Joe Beery (Hillsboro, Ohio/Hillsboro HS) has been named to the Capital One Academic All-America® Division I Men’s Track & Field/Cross Country third team, as selected by the College Sports Information Directors of America (CoSIDA). “Joe is the driving force behind our men’s cross country program,” Stetson head coach Joe Matuszczak said. “His determination and will to succeed has helped our men’s team reach another level. If you spend one 8-mile run with him, you can see how special he is. Not only can you learn more about his world and religious views, but you will hear him practice three or four languages out there. A double major in Philosophy and Russian Studies, Beery has maintained a perfect 4.0 cumulative GPA during his first two years at Stetson. He earned Atlantic Sun Conference Scholar-Athlete of the Year and first team Academic All-District honors in 2014 after competing in all eight races for the Hatters, finishing first on the team five times and second three times. He posted a season-best time of 26:52 at the UF Mountain Dew Invitational, marking the second-fastest 8K time in school history. He also led the team with a time of 27:05 at the Atlantic Sun Championships, placing 33rd overall. Beery was just one of 13 Men’s Track and Field/Cross Country Academic All-America® honorees in all of Division I to have a perfect 4.0 cumulative GPA. Beery is just the eighth Stetson student-athlete all-time to earn Capital One Academic All-America® honors and the first since 2005. Previous honorees include Brenda Elrod (Women’s Basketball), Karen Lovaglio (Women’s Basketball), Chris Shields (Baseball), Taryn Lynn (Women’s Tennis), Chris Westervelt (Baseball, twice), Katie Harrigan (Softball), and Brittani Houghton (Softball). The Capital One Academic All-America® program is the top academic award program in college athletics. To be eligible for consideration, a student-athlete must be a varsity starter or key reserve, maintain a cumulative G.P.A. of 3.30 on a scale of 4.00, have reached sophomore athletic and academic standings at his/her current institution and be nominated by his/her sports information director. Story courtesy of Stetson University Athletics.